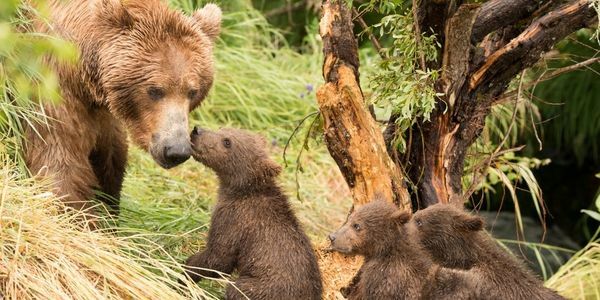 petition: Save Yellowstone Grizzly Bears! Grizzly bears in Yellowstone National Park have made a modest recovery since they were placed on the Endangered Species list in 1975.Where there were only 136 grizzlies in the seventies, there are now 750 living in Yellowstone today. And yet, given a vulnerable population that is still less than a thousand strong, the federal government is now moving toward taking the Yellowstone grizzly off the endangered list--which would make the bear a target of trophy hunters. Severe food shortages have made the grizzly's struggle for survival an epic battle. Overfishing has depleted the resources of trout that make up a big part of the bear's diet. Climate change has caused a steep decline in wild berries--another vital grizzly food. Every time a hungry, desperate bear attacks a hiker, the bear is euthananized. An open season on these bears will drive them back to the brink of extinction. Meanwhile, the grizzly bear is sacred to Sioux mythology, and Sioux tribe members are strongly opposed to its delisting. Hunting and killing a grizzly bear is tantamount to sacrilege in Sioux belief. Please join with me in demanding that the Yellowstone grizzly bear remain on the endangered species list. We the undersigned are dismayed to learn that you are moving in the direction of taking the Yellowstone grizzly bear off the Endangered Species list. The grizzly has not made a miraculous recovery. After forty-five years of struggle for survival, there are now a modest 750 grizzlies living in Yellowstone. The park is hardly overrun with bears. This is a small portion of the historic bear population in Yellowstone. Both climate change and overfishing have struck hard at the gizzly bear's food supplies. There are not enough trout or berries for the grizzlies to eat. The park's grizzly population is still quite vulnerable. Delisting is not appropriate at this time.